The Serenity memorial is dedicated to Navy Lieutenant Commander William Henry Schuetze. It was given to the United States by Charles Deering. Deering and Schuetze were classmates at the U.S. Naval Academy in Annapolis, Maryland, and graduated in 1873. According to the Deering Estate: “Charles Deering, a Civil War child, was enthralled by stories of naval heroics. He entered the U. S. Naval Academy as a cadet midshipman. In 1873, he graduated second in his class. Charles’ roommate and best friend, William Henry Schuetze, graduated in the top position.” Schuetze served in the United States Navy until his death in March of 1902. The Serenity Statue had been completed by the time that Charles Deering “offered” the statue to the people of the United States for a memorial to his Navy Academy classmate and friend William Henry Scheutz. Deering had purchased the statue in Paris in 1900. When Schuetze died in 1902, Deering offered as a gift to the United States in memory of Schuetze. The Commission of Fine Arts welcomed the statue calling it “an ideal statue designed by Jose Clara, a leading Spanish sculptor of to-day [sic], this Commission welcomed the idea. Congress having so authorized, a site was selected in Meridian Hill Park, where the statue of Serenity takes its place among the other distinguished works in a garden-park.” The memorial was accepted in 1924. The statue was placed in the park in July 1925. Note: William Henry Schuetze’ name is misspelled on the monument. Serenity is located in the northwest side of the park facing Sixteenth Street. The statue is sculpted by Jose Clara from a solid block of Carrara marble. The sculpture is 5’ 6” tall and shows a woman wearing long, flowing classical robes which are tied at her waist, her arms casually rest on rocks behind her. Her left foot rests on a broken sword. Often referred to as the most abused memorial in the city, The Washington Post reported in 1926 the Serenity statue was painted with red and black paint. In 1934 her face was painted with lipstick and rouge. Sometime in the 1950s Serenity’s nose was broken off. And in 1960 it was reported that two fingers were missing from her left hand and one from her right hand. And in 1990 the statue was spray painted with the word Uhuru. 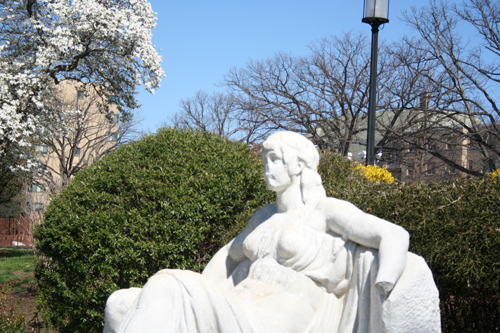 In another story of disrespect for the memorial, in 1933, with only the upper portion of the park completed and officially opened, the Columbia Heights citizens association called for the removal of Serenity on artistic grounds calling the statue offensive.